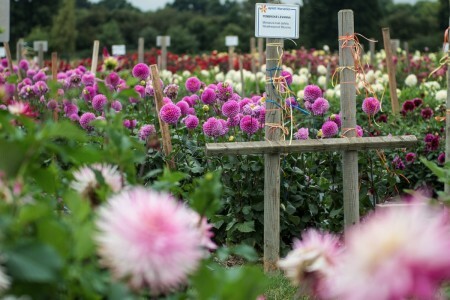 During our Autumn Festival we asked visitors to our Dahlia Field to take a piece of ribbon and tie it to the end of the row of their favourite Dahlia, the ribbons have been counted and the results are in… The top three all have very different flower shapes, and perhaps show just what a wide and diverse family the Dahlia belongs to. The large dinner plate Giants that were traditionally grown on allotments although still in our range have given way to these more dainty garden favourites. When you look in our Dahlia field today, although it is the 10th of October, the colour that is still on show do make these fantastic plants one of the true late summer greats. 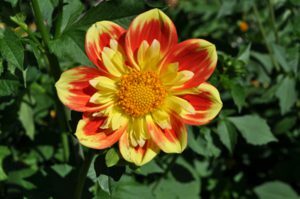 A Collerette Dahlia which grows to about one metre in height in a garden border. The scarlet tipped yellow blooms, with a yellow collar make it a real eye catcher. Pooh has already been awarded the Award of Garden Merit by the Royal Horticultural Society. 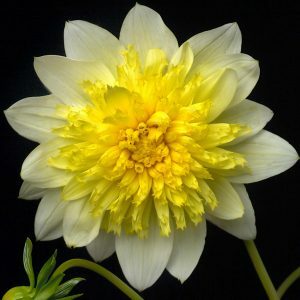 This is an Anemone Flowered Dahlia which grows to about a metre in the garden. It has bright yellow central tubular florets, which are fimbriated, surrounded by flattened ring of pale yellow outer petals. 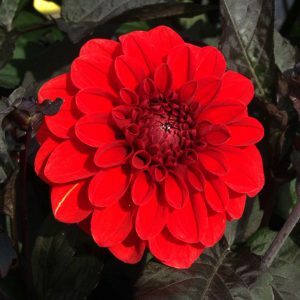 Is a Miniature Flowered Decorative Dahlia with the brightest of red flowers on nearly black foliage. Interestingly this was last in the top three back in 2013 when it won Customer’s choice. Previous Post: Macmillan Coffee Morning raises over £1,900!